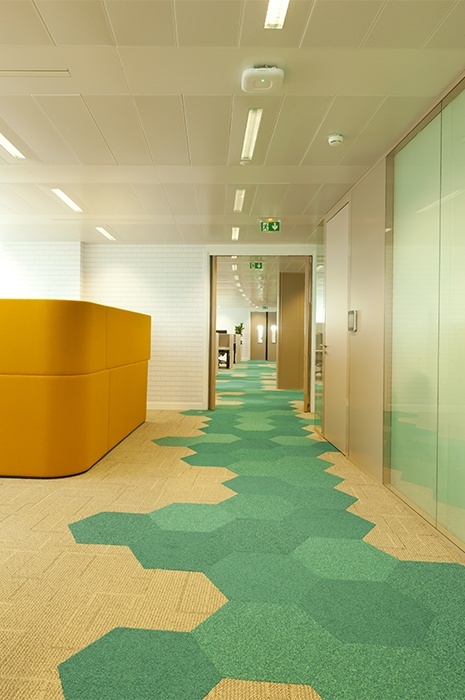 Are Carpet Tiles the Right Choice for Your Next Design Project? How Much Will My Carpet Tiles Cost Me? 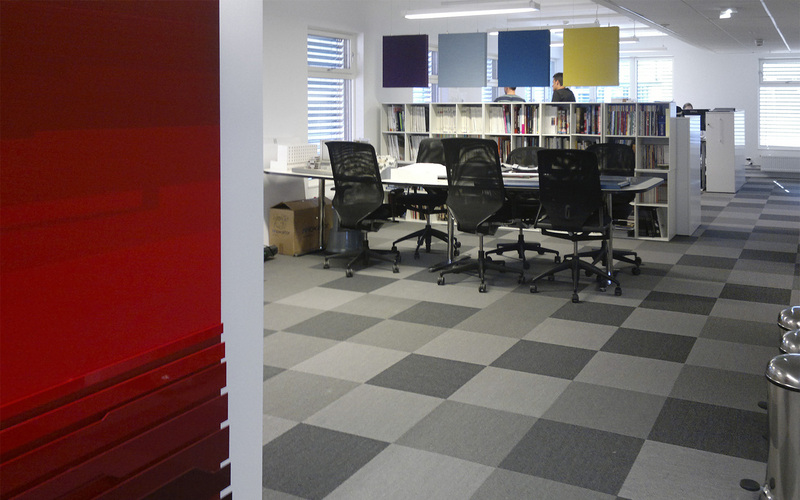 Thinking of Carpet Tiles For Your Project? A major decision in the design of any space is the flooring you select. The surface you step onto when you enter a space, whether you think about it or not, is your first impression of it. Further, since flooring often makes up a major portion of the project budget, it’s a choice that shouldn’t be taken lightly. The good news is, with carpet, you really can’t go wrong. The advantages of carpet are many. For one, carpet offers many practical benefits: superior comfort, attractive acoustic, and thermal qualities, as well as greater safety, compared to hard surface alternatives. Carpet offers so much more than practical advantages, though. The way you deploy it in your design can affect the look, feel and sound of a space. The colours and patterns of your carpet can convey your unique ambiance. You may be under the impression that landing on your unique carpet design will cost you time and money, or that choosing carpet means taking on installation delays, keeping you from the rest of your design work. With carpet tiles, you don’t have to worry about any of this. Modular, attractive, high-quality and less expensive, carpet tiles are a great flooring solution that makes installation easier. This guide will tell you everything you need to know about carpet tiles and how to use them in your next project. Enjoy! Carpet tiles are small swatches of carpet, made from broadloom carpet, that can be installed and combined in a number of creative ways. Also known as “modular carpet,” carpet tiles are most often square and available in a range of square sizes – 48 x 48, 50 x 50, 60 x 60 and 96 x 96cm - as well as in ‘planks,’ which are long rectangular shapes. Some manufacturers, however, also offer carpet tiles in a variety of creative shapes. Generally equipped with pre-attached carpet backing, carpet tiles are often able to be installed directly onto the subfloor, making for a quick and easy installation. For the majority of projects, carpet tiles are a superior choice both practically and in terms of design. That’s why we recommend you - at the very least - consider carpet tiles for your next project. So what are the advantages of carpet tiles? Carpet tiles are easy to lift and transport, making it easier to get them on the job site undamaged, in the first place. Carpet tiles, because they’re pre-backed, can be installed directly onto the subfloor, eliminating the need for underlays. This saves a lot of time and effort, not to mention money. Carpet tiles don’t always need to acclimatise, or settle in place for 24 hours before they are laid. While not exactly recommended, in situations where time is of the essence, carpet tiles can even be laid with furniture in place. Carpet tiles generate minimal waste in the fitting stage. This is because very little cutting, or adjustment, is needed for tiles to fit a given space. This is particularly true of rooms with many nooks and odd angles. You can expect a waste of around 1-3 %. Less waste means less money spent, but is also attractive for clients concerned about sustainability. In the past, design versatility was basically impossible with carpet tiles. Carpet tiles were merely thin squares, available in a narrow range of colours and qualities. This outdated conception of them may be holding you back from selecting them, in spite of some of their obvious benefits. Rest assured, today, you can accomplish almost the same degree of design versatility with your carpet tiles. New dye technologies have made it possible to achieve a wide range of colours and patterns. It’s even possible to apply a custom design to your carpet tiles. Beyond this, you can use the configuration of the tiles themselves for effect. For example, different colour variants can be used to create a checkered pattern. Tiles with a simple pattern can be laid in different directions for both textural and optical effect. More and more, we see unique approaches to carpet tiles gaining in popularity. 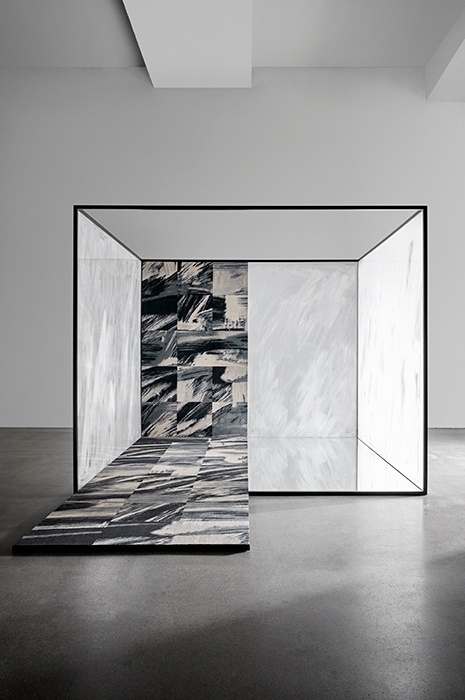 Creative designers and architects are using colour and pattern to facilitate way-finding and delineate different zones for different uses, subtly nudging behaviour. An oft-cited advantage of carpet tiles is the ease with which you can maintain them. Carpet tiles can easily be removed for cleaning, or replaced if a single tile is overly soiled or destroyed. Since tiles are small and modular, they don’t take up much space and can easily be stored. It’s a good idea to have extras on hand so you can sub out tiles as needed. Further, because tiles can be easily lifted, you can readily access underfloor cabling as needed. While wall-to-wall carpet is said to be the go-to option for luxury and plushness, carpet tiles can come pretty close. Cut from broadloom carpet, carpet tiles can often achieve a similar quality to wall-to-wall carpeting. In fact, carpet tiles with their absorbent layered structure, absorb even more structure-borne sound. When selecting a carpet, many designers get hung up on choices, such as colours or patterns. These are certainly important decisions, but before you get there, you should be considering what type of carpet best suits your project. 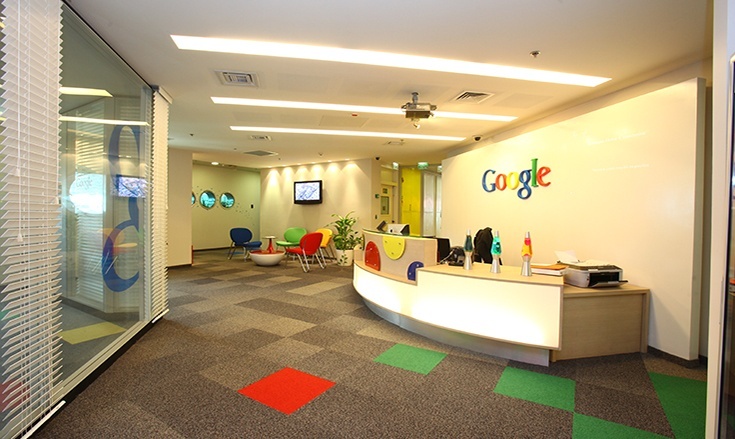 Carpet tiles are a cost-effective choice suitable for most projects. While wall-to-wall carpets still remain the most popular choice for commercial projects, carpet tiles are gaining traction with designers and architects that realise choosing carpet tiles means saving time and money, as well as reducing waste, without compromising on quality and aesthetics. While it used to be that carpet tiles were those cheap squares of low-quality carpet that you could only get in a few standard colours, this is just not the case anymore. Technological advancements have made it possible to achieve a great deal of design freedom with carpet tiles. You should keep in mind, though, the further you stray from the standard options, the less you benefit from the upsides to modularity. For example, while it’s possible to choose from diverse shapes and apply custom designs to your carpet tiles, doing so might increase the price and make for a more complex and time-consuming installation process. There are a few other downsides to carpet tiles you should keep in mind. For one, even when installed flawlessly, you will always be able to see the seams between them. While new technologies have been able to reduce the appearance of seams, if your objective is the look and feel of a single piece of flooring, carpet tiles may not be the right choice. Further, while you can nearly match the quality of wall-to-wall carpeting with carpet tiles, you generally can’t get the extra plush underfoot feeling that you can with certain wall-to-wall carpets. 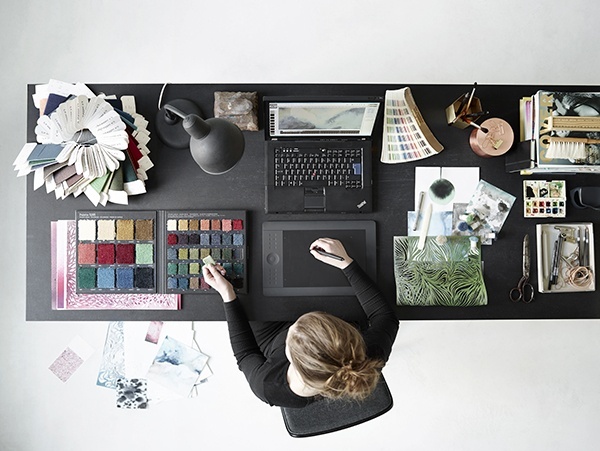 For most projects, though, designers and architects feel the pros outweigh the cons. Carpet tiles are a good choice for the projects where a stunning end result is required, but where budget or time may be restricted. They’re also a great choice for projects where regular maintenance is a concern. Wall-to-wall carpet is carpet that covers an intended space in few pieces - or even a single piece - as opposed to many pieces laid out to create your flooring. As opposed to carpet tiles, which can be laid directly on subflooring, wall-to-wall carpets are generally laid on underfelt, over the substrate flooring and attached using small tacks. Because of the many carpet backing options with wall-to-wall carpets, you can achieve a certain underfoot comfort that might not be attainable with carpet tiles. Further, with its seamless finish, wall-to-wall carpeting grants you a high degree of creative freedom if you decide to go with a custom design, as you won’t have to deal with breaks in fabric. The downside of wall-to-wall carpets, however, comes in the installation phase. Installation of wall-to-wall carpeting is more demanding and time-consuming than the installation of carpet tiles. Further, the waste produced in the process is simply greater - 5-25%. While it’s often the more expensive option, wall-to-wall carpeting might be the choice for you if your project requires large-scale patterning, or intricate customisations. Generally speaking, wall-to-wall carpeting works best for projects with big design ambitions or for large floor surfaces. Think wall-to-wall carpet might be the right choice for your project? Check out our comprehensive guide on wall-to-wall carpet and find out. Carpet tiles offer ease of installation, saving time and money. Carpet tiles are a good option where regular maintenance is of great concern. Wall-to-wall carpets are best for large-scale patterning or custom designs. Wall-to-wall carpets generally have that extra touch of quality that you can feel when walking on them, and see when looking at the seamless surface. Now that you’re clear on the different carpet types, let’s take a look at the other carpet properties that will likely influence your decision: carpet construction, styles and fibres. When considering carpet construction, you’re generally choosing between three options: tufted, woven or needle punched carpets. While the overwhelming majority of carpets tiles are tufted, it’s useful to get a feel for all the options available, in order to make a more informed decision. 95 % of all commercial carpets on the market are tufted. That’s because tufted carpets have a fast production time, are priced lower and have a variety of different designs available with them. While tufted carpets work for most projects, when high quality and endurance are your main concerns, they might not be the ideal option. Woven carpets, or carpets produced on a loom, were the only option up until the 1950s. Even though advancements in production machinery and synthetic materials have allowed for other possibilities, woven carpets are still on the market and widely selected today because of their superior quality and durability, particularly with natural materials. Woven carpets are a good choice for higher-end projects. Needle punched carpets are colourfast, dry quickly and are resistant to sunlight and fading. While practical, they lack versatility in look and feel. Needle punched carpets are great for things like entry mats, but not recommended for general use. Another factor to take into consideration when designing your carpet tile solution is carpet style. Below, we’ll elaborate on some main styles: cut pile, loop pile and cut and loop pile. There are a number of different variants within these styles, but this overview should get you started. For a more in-depth look, check out our carpet glossary. Loop pile carpeting is achieved through looping yarns, to bring about a soft, smooth look and feel. In loop pile solutions, higher and lower loops can be combined to play with texture and pattern. Cut pile carpets are created by cutting yarn loops to create an upright pile. Cut pile carpets bring about a more formal, or luxurious look and often appear darker than loop pile carpets comprised of the same yarn type. Cut and loop pile carpets are comprised of a combination of cut and looped yarns. The combination allows for sculptured effects - such as squares or swirls - and a wide range of patterns and styles. When designing your carpet tile solution, you should also pay mind to the kind of fibres your carpet is made of. Very often, carpet tiles are made of a blend of different fibres. It is useful, though, to understand the properties of the individual fibres, in order to get a feel for what your project will require. Carpets are typically made from nylon, polyester, polypropylene, cotton, acrylics, wool, and/or recycled material. Let’s take a moment to examine a few of the most popular options. You can find more in our carpet glossary. Wool, generally a more pricey option, is a natural fibre known for being strong, luxurious and highly stain resistant. Wool, soft and dense, gives a very comfortable feel, yet also maintains impeccable structural integrity. Due to its natural cream colour, wool has a more subdued look than options like nylon. Polypropylene is a synthetic fibre with an appearance similar to that of wool. Like wool, it's quite a stain-resistant fibre, but it lacks the same durability as wool, or other synthetic fibres for that matter. It is, however, highly resistant to fading. Nylon, a less expensive option, is a polymide, meaning it's known for durability, resilience and comfort. It is static free, maintains fibre height, and does a great job of resisting staining, all of which makes it a popular choice. Nylon tends to have a glossier, sharper appearance. Polyester, another synthetic material, is also known as a less expensive option. A rather versatile fibre with a long history of being used in carpet manufacturing, polyester is generally considered to be a lower-quality choice, compared to nylon. Technological advancements, however, have increased the fibre's durability to an extent. Becoming increasingly popular are fibres made from recycled materials, such as fishing nets and other industrial nylon waste. This solution, a mid-range price option, is sustainable as well as durable and attractive. Sustainability is an increasingly important consideration for architects and designers, as well as the clients they design for. 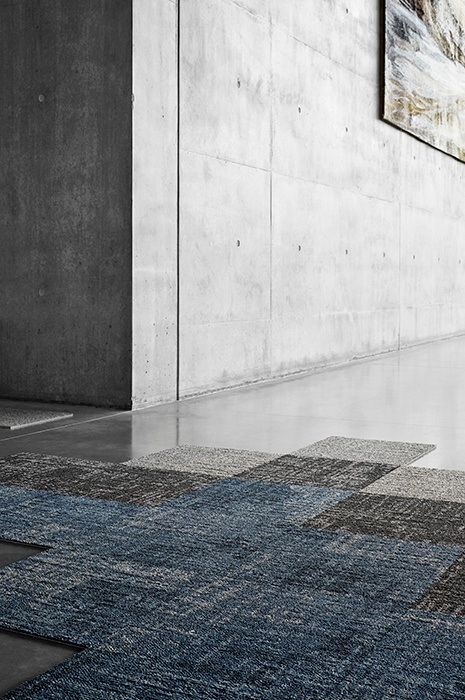 Because of the minimal waste that carpet tiles produce in installation, selecting them for your design means you’re already on the path to sustainability. Above this, though, you’ll want to ensure that you choose a carpet manufacturer that considers and actively addresses their environmental impact. Many carpet manufacturer globally, for example, use bitumen and PVC in their carpet backing. They do so predominantly to cut costs. There are no specific provisions in place to ensure manufacturers don't do this, however, this practice is harmful to the environment. If this is an important consideration for you, make sure to inquire with your supplier about these additives and choose a manufacturer, such as ege, who avoids them. 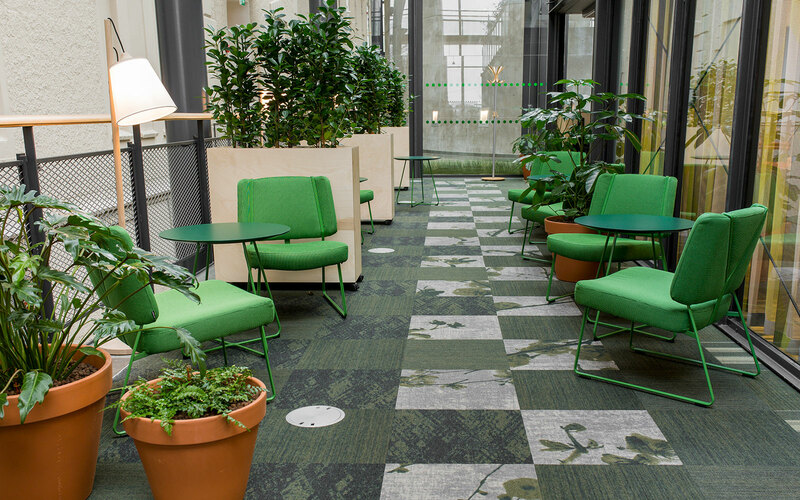 As standard, carpet tiles manufactured by ege come backed with Ecotrust 350 felt backing - made on recycled water bottles that are then converted into soft, but durable felt. 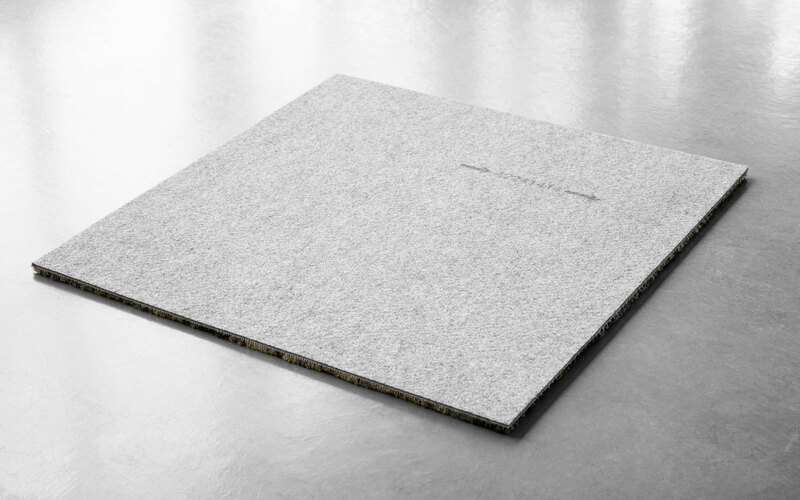 Also possible is ege’s Ecotrust 750 carpet backing, made from the same technique, but with the added benefit of higher weight and thus a more comfortable underfoot feel and even better sound-absorption properties. Further, ege incorporates ECONYL®-yarns made from recycled fishing nets and other industrial nylon waste into a number of their solutions. Some examples are their modular possibilities within ege’s ReForm concept and Rawline Scala collection. 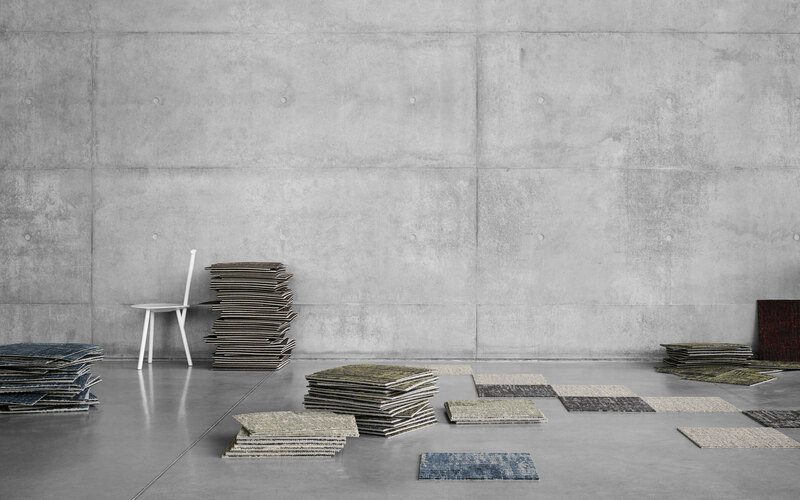 If sustainability is top-of-mind for your project, take a look at our article “11 Things You Need to Look For When Talking Carpets and Sustainability” and see the additional ways ege addresses sustainability across their product selection. Nothing’s worse than a place where no matter what you do, you can’t hear the person you’re trying to talk to. This is why acoustics are an important consideration in most projects. 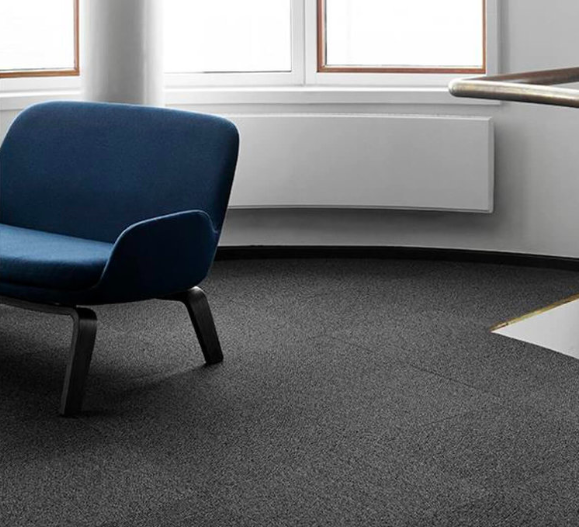 Whatever space you’re designing for, with their layered structure, ideal for absorbing structure-borne sound, carpet tiles are a great choice when it comes to reducing noise. The acoustic performance of a carpet, though, hinges also on the padding, or carpet backing used beneath it. Since carpet tiles are pre-backed, you might be concerned that they can’t deliver the same acoustic properties as, say, a wall-to-wall carpet paired with an acoustic-optimised backing. You needn't worry, though. 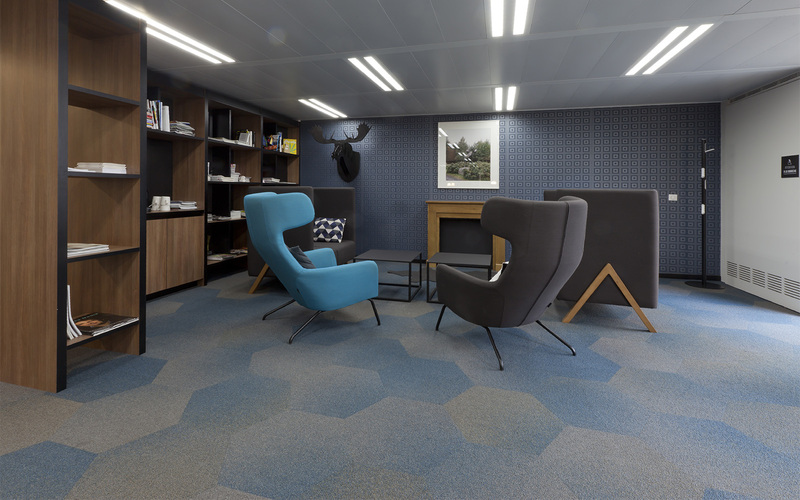 As carpet tiles are very often used in environments, such as offices, where noise is of top concern, carpet manufacturers have followed suit and offer standardised backing solutions with attractive acoustic properties. Further, many manufacturers allow you to specify your carpet tiles with a different backing, to find one that best suit the needs of your project. The project you’re designing for is the ultimate determinant of the properties you’ll need to consider in your carpet selection. For example, in office spaces, acoustic properties might be your top concern, while if you’re designing for a hotel, your top concern might be luxury. Designing for hospitality is many things. From five star hotels and fine dining, to jam-packed bistros, pubs and clubs. The carpet you select depends on what kind of hospitality project you’re working on. 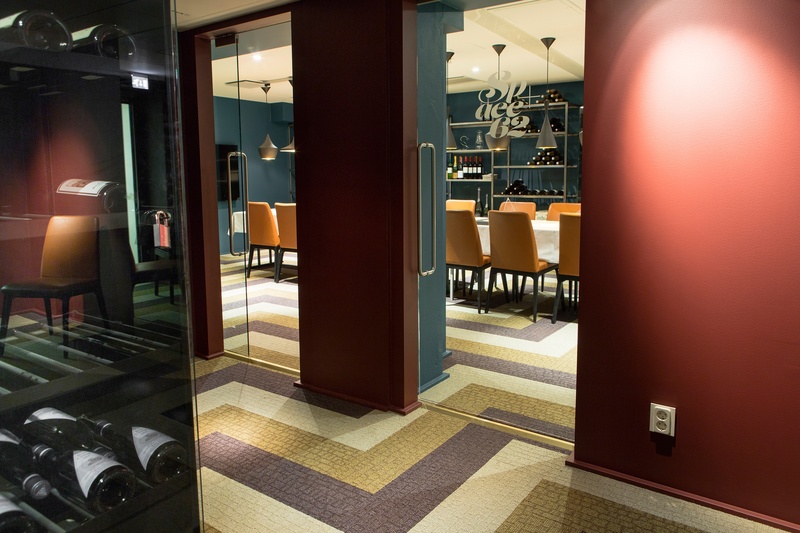 For a fine hotel or restaurant, carpet tiles may not fit your needs. In these settings, a high quality, custom wall-to-wall carpet is your best bet. 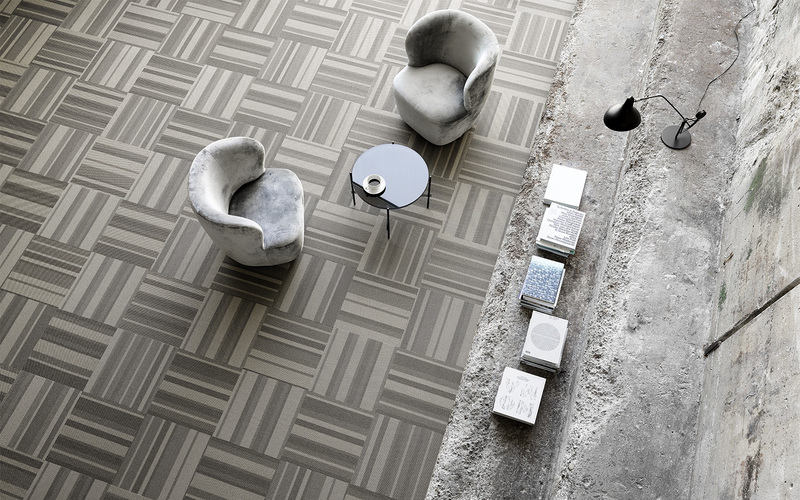 Wall-to-wall carpeting will let you achieve the degree of customisation and the lush underfoot feel that such high-ambition projects would require. For everything else, though, you may want to consider carpet tiles. 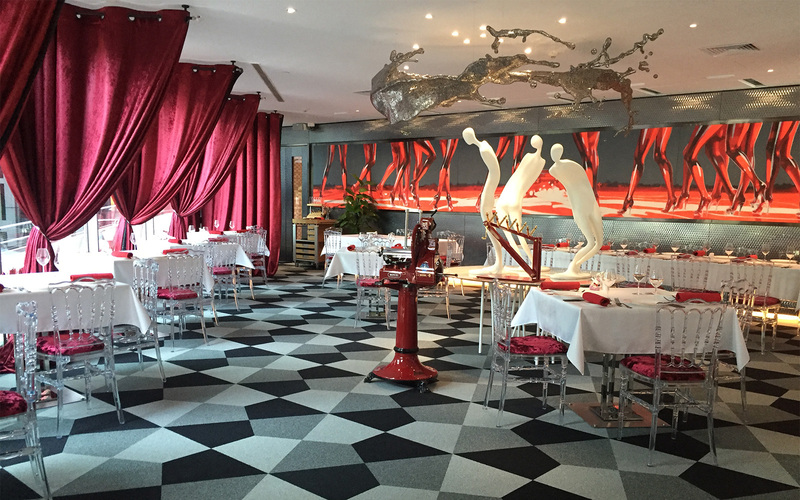 For projects such as bistros, clubs or pubs, carpet tiles are becoming increasingly popular. They offer a great value for money, but further, the endurance, easy maintenance and acoustic properties absolutely necessary for these sorts of projects. Beyond this, they can bring the comfort, texture and warmth carpet know for, as well as the unique and fun designs carpet tiles do best. So play with varied colours, patterns and shapes of your tiles to create stunning effects and depth with your designs. For a great selection of hospitality carpet tiles, you should consider ege’s modular options within the Highline concept, or maybe even consider a custom design. Need some inspiration? Check out some of our favourite projects with hospitality carpets in the hospitality section of The Urge to Explore Space blog and check out our comprehensive guide on hospitality carpets to learn even more! When designing for offices, a main concern is acoustics. This is especially true in open office plans, where excessive noise can hinder productivity. 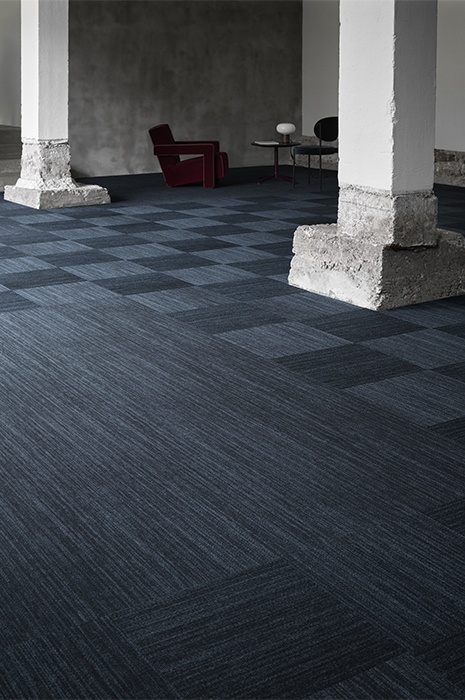 With their layered structure, ideal for noise reduction, carpet tiles are a great solution for office projects. 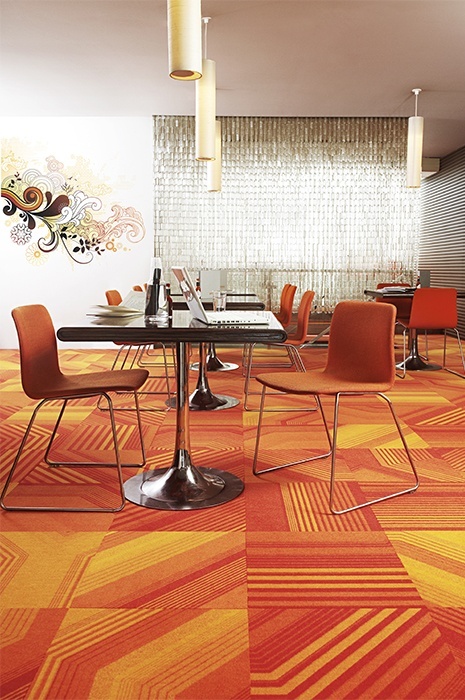 For many offices, though, designers are going beyond the practical benefits with their carpet tiles. Creative architects and designers are using carpet tiles to tell a brand story, promote wayfinding, delineating break-out areas, or even to stimulate innovation. ege’s modular options within the Epoca concept are a great option for modern office design. With subdued designs, inspired by Scandinavian minimalism, Epoca has a great and sophisticated option for almost any office project. Keep in mind, though, while prices vary – depending on yarn amount, quality, etc. – generally speaking, the wide variety of colours will cost you a bit more. 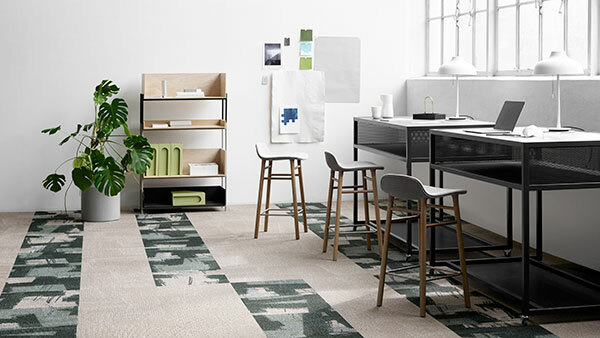 Alternatively, ege’s modular options within the Una concept can offer you an attractive, but less expensive option for office design with carpet tiles. 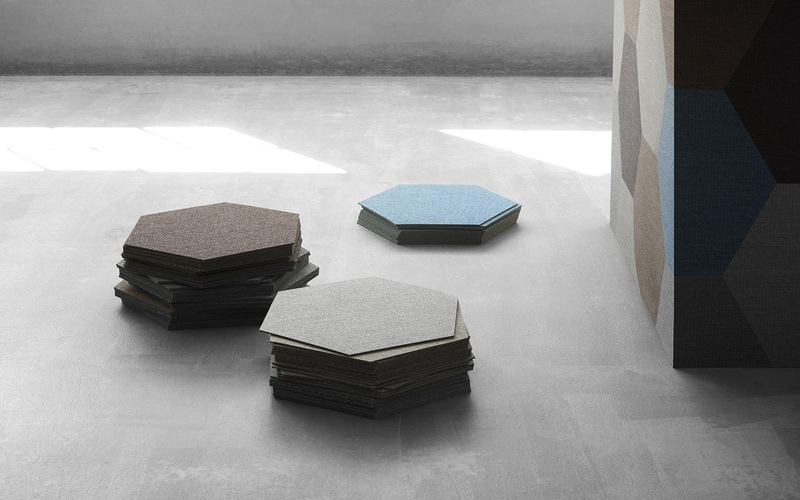 Comparable to the Epoca concept, on most fronts, carpets within the Una concept are based on pre-coloured yarns. 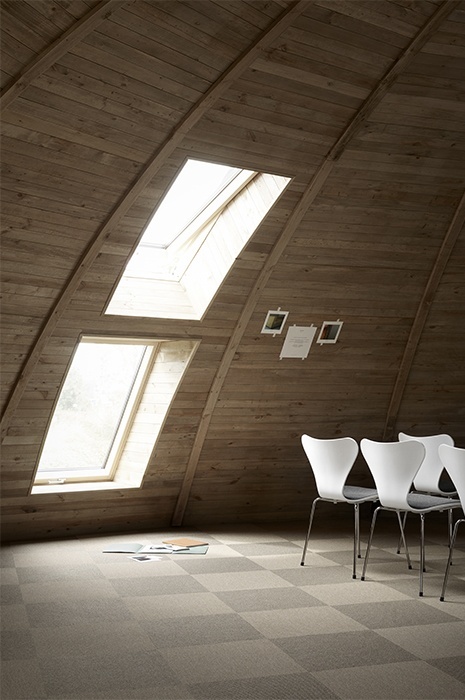 The high durability and great value of Una carpets make them a very popular choice for office projects. Get some inspiration for your project from the office carpets section of the Urge to Explore Space Blog. 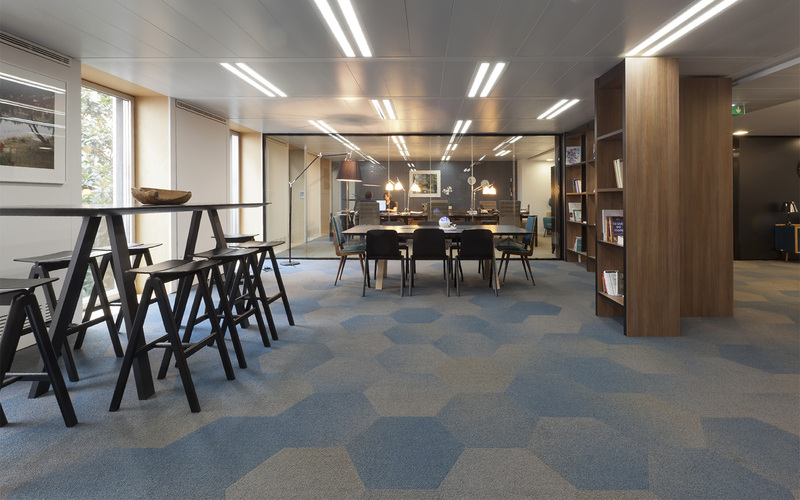 For more information on how to select and design a carpet for your office project, check out our comprehensive guide on office carpets. EN 1307 is a European standard, rating carpets on their long-term appearance retention. Certified carpets are rated in terms of domestic and commercial classifications. Class 31: Moderate usage. Suited for lighter traffic. Class 32: Normal usage. Suited for most commercial projects. That is, areas with a high, but not extreme amounts of traffic. Class 33: Heavy usage. Suited for areas with extreme amounts of traffic. Recommended for projects where spilling, soiling, or large amounts of traffic from outside areas are expected. To qualify for ISO 10361, a carpet undergoes the Vettermann Drum test, designed to determine how much a carpet will change, as a result of heavy foot traffic. Results of the test are given on a 1-5 scale, where 1 is a heavy change and 5 is no change. Fire classification - Two fire and smoke tests are required according to European standards. Many carpets are also treated with flame retardants or incorporate flame retardant fillers for added safety. Colour fastness - Carpets are tested for colour fastness, or resistance to colour fade, after undergoing wet and dry rubbing techniques. Performance is based on a 1-5 scale with 5 being the best. Light Reflectance Value - Light reflectance refers to the percentage of visible light reflected to the light of the human eye. The light reflection value impacts the look of your final project. Light-coloured carpets, because they reflect a greater portion of light, require more maintenance. ISO 354 - Measuring a carpet’s acoustical absorption. For a more complete look at carpet compliance, see our article, “Understanding Carpet Properties, Certificates and Classifications”. If you're unsure if the carpet you’ve selected - or intend on selecting - is in compliance with local laws, or if you simply want more information about it, please don’t hesitate to reach out to us. We’re happy to assist you or direct you to your local point of contact. With the knowledge on hand to pick out the perfect carpet tiles for your project, now it’s time for you to go forth and get some carpet tile inspiration, and there is certainly no shortage of it! Carpet has experienced a swell in popularity, in recent years, and has increasingly become the focal point of opulent and unique interior design. 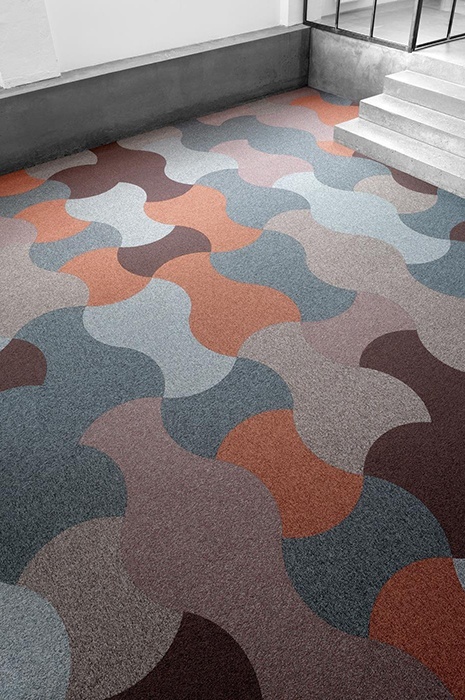 While we often think of hard surfaces and sleek tiles as the epitome of style and modernism, carpet has the ability to bring in colour, comfort and warmth, giving designers a lot to work with. Carpet tiles bridge the two options. With design versatility and ease of installation, carpet tiles seem to offer the best of both worlds. 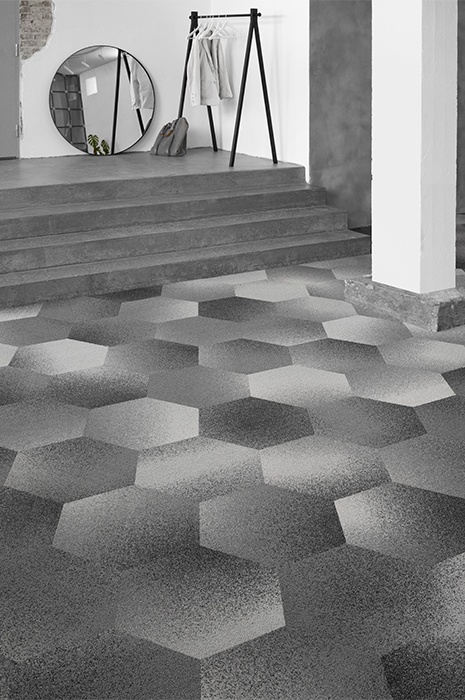 Check out our articles on the three carpet trends to look for and four new design trends to watch for, to see how your carpet tiles can transform your project. For the especially creative, check out these unexpected ways to use carpet. Now you know a whole lot about carpet tiles and how to make a great selection for your project. You may even have your carpet tiles selected already, but what should you do before you install? The great news is, with carpet tiles, there's not much you need to do. In this next section, though, we’ll give you some tips to ensure your installation goes as smoothly as possible. Before you place an order, it’s always a good idea to grab samples. You would never choose a paint colour without samples and likewise, you should never choose a carpet without them. Keep in mind, a carpet’s appearance can vary in different settings, with different lighting, etc. Take the carpet on site, emulate the conditions you expect the carpet will be displayed in and be sure your sample is in the same quality as is specified for the final carpet. Before you dive into your installation, be sure you have a plan. While carpet tiles make installation much easier and planning is certainly less of a headache, it is still a good idea to talk out the details of your installation with your floor fitter and supplier before getting started. We suggest that you prepare a carpet placement plan and have your carpet supplier check it to ensure all details are correct. So you’ve placed your order and you’re ready to install your carpet tiles. Before delivery, though, make sure you have all relevant details from your supplier and installer. Sometimes you need to account for a 24-hour wait time for your carpet to acclimatise before installation can start. You may also need to prepare for 48 hours, or more, to air the space out after installation. While these steps are sometimes unnecessary with carpet tiles, we suggest you contact your supplier to find out. A smooth installation depends on a clear plan. Use our installation checklist to be sure your process is completed on time and on budget. Keep in mind, we’re here to assist along the way - no matter where you are in the journey. From general questions to custom design ideas, don’t hesitate to contact us. The key to your client remaining happy with their carpet selection lies in their ability to maintain it. You’ll want to help them establish a carpet tile maintenance plan that they can keep up, to keep their carpet tiles looking great. Track-off areas - areas where a carpet is vulnerable to tracked-in soil. These areas average 6 x 15 metres at building entrances, 2 x 5 metres at internal doorways, and 5 x 8 metres in corridors of approximately 2 meters. Congested channels - areas prone to substantial foot traffic, such as doorways or stairwells. These areas include an average of 0.9 metres around doorways and three metres around elevators. Traffic lanes - areas with the highest degree of anticipated foot traffic. Maintaining these areas can happen proactively, through use of mats, or it can happen through daily maintenance and spot treating post installation. For more information, check out our service and maintenance guide. Carpet tiles are generally less expensive than wall-to-wall carpet. This is true both in initial costs and especially in total costs, due to differences in installation difficulty, waste and time. With that said, though, depending on the quality and design of a wall-to-wall carpet the prices can be comparable. Ege, for example, has a number of wall-to-wall selections that are actually less expensive than carpet tiles. The greater the amount of yarn used, the higher the price. Natural fibres are generally more costly than synthetics. For wool, the pureness and average length of fibres will determine the price tag. For nylon, prices depend on the use of bulk continuous filament (BCF) or stable fibres. Pre-dyed yarn can reduce the price tag of nylon. Polyester is generally cheaper than Nylon, though different qualities can increase this price tag. Polypropylene is typically cheaper than it's synthetic counterparts. Custom designs are more costly than standard ones. Generally speaking, with carpet tiles you’ll select between felt or woven textile carpet backing—with felt being the most expensive. As standard, ege carpet tiles come backed with Ecotrust 350, made from recycled textile material. Otherwise, you can select the Ecotrust 750, which will cost a bit more. Many carpet manufacturers globally use bitumen and PVC in their carpet backing, this is a cheaper option, but is environmentally harmful. Installation with carpet tiles is cheaper than wall-to-wall installation, both in terms of the savings gained from a speedier and simpler installation, but also in terms of waste reduction. No matter where you are in the process - from idea to unique carpet solution- we’re here to help! Please don’t hesitate to contact us for assistance with your carpet tile project.